8/10★ -- Ever since Ariel Pink cited him as an influence, Tennessee’s R Stevie Moore has toured the world and become something of an icon for hipsters. But Moore doesn’t care about fame. Since 1968, he has released over 400 albums, many of them on cassette or CD-R on his own label. This compilation harvests a selection of his 1973–2001 output of country, garage and general weirdness. Highlights include Moore singing tortured love songs over classical records, and ‘Copy Me’, an ode to cassette piracy that sounds like Syd Barrett and Mark E Smith covering The Cure. It’s bonkers, but it’s hard not to be wooed by Moore’s outsider charm. There's a problem with R Stevie Moore's music and he knows it. "The songs are too weird," he chants at the end of Why Can't I Write a Hit?, over scattershot blips and burps, disrupting what began as a rainbow-bright tune that might sound perfectly happy on the radio sandwiched between Super Furry Animals and the Flaming Lips. Moore does this a lot: grafting abstract noise on to golden melodies, juxtaposing melancholy emotion with self-deprecating humour, a bedroom Brian Wilson without the commercial imperative of the Beach Boys to curb his idiosyncracies. He's spent the past 40 years recording and distributing album after album on cassette and his uncle's record label; this is his third compilation release in as many years and, like those put together by Ariel Pink (2011) and Tim Burgess (2012), it constructs a fairly coherent picture of his wayward style. From the absurd country hoedown of Quarter Peep Show to the genteel chamber music backing Makeup Shakeup, from the daft wordplay of No Body to the musings on age in Old, Moore's experiments may be weird, but they're a whole lot of fun. Unrelated thoughts and sounds can sometimes find an uneasy home together, even an alternate meaning, when juxtaposed with one another in close confines. On compilation album number 42 (there’s meaning there if you want it) culled from his 400+ deep back catalogue, 61-year-old R. Stevie Moore presents us with a 15-track collage of what are, in and of themselves, miniature musical collages, clashing like cymbals. Casting himself as the eternally lovable loser, the savant, the joyous cynic, the downbeat clown as he has for the span of his four decade career, it serves as a compliment to last year’s Lo Fi High-Fives, a majestic strut through some of the New Jersey bedroom maestro’s most accessible, most ‘pop’ material. While that record had the big tunes (‘Showbiz Is Dead’ and ‘Big Mistake'), you’d expect this default companion piece to delve down into Moore’s plentiful excursions into more impenetrable experimental music. It doesn’t – instead offering a gentle slide into the swirling pool of Moore, obscurities that hint both at his pop potential and his avant-garde tendencies. What Moore does most, maybe best, is the unexpected. The alarming comic cod-cockney rant of ‘Makeup Shakeup’ – a chamber orchestra backed dose of criticism for a female friend covered in slap who has "mascara dripping down your lips / and now you’ve got it all over your hands / what a mess you are ". It’s a carefully conceived abstraction of both classical music and rock misogyny that’s not willing to play ball with expectation or convention. When you would normally hear words of love and devotion, perhaps of loss, as on the ostensibly tender acoustic ballad ‘The Picture” you instead get a wanking song to match Sebadoh’s ‘Homemade’ in naivety and sweetness – “I never thought your picture would always treat me right” he pines, then wrongfoots us once more with the ludicrous “All I can do is look / at your privates in a book”. Where there might be generic, predictable quirk-rock as on ‘Pretend For A Second That You Are Very Intelligent’ you instead get grinning but grave proclamations of the death of music – “Everyone knows rock n roll is deceasing/ It’s all just repetition” before welcoming us all back in (after a fashion) with “Why are you acting so dumb?...You should be unable to control your imagination”. Joyous misanthropy isn’t something you come across too often. Musically Moore is all over the place. ‘Quarter Peep Show’ is a reverbed-out hoedown splashed with wails of frustration; ‘Forecast’ is hung together by cowbell and handclaps before a zombie Gene Vincent riff rears up and collapses on itself; ‘Man Without Purpose’ a primitive trance tune conducted on what might be an antique Bontempi. This is no bad thing. Incongruity is key, discomfort vital. There are, even while marveling at the lysergic otherness of it all, absolutely great songs here. ‘Old’ is a Super Furry treat as we discuss cold dinners to the sounds of alarm bells and gorgeous harmonies half-buried in the collapsing debris of Moore’s musical construction; ‘Structure Of Love’ hears Peter Buck e-bow over chiming Byrd strums made strange by sudden breaks in sound, sharp drops like a sentence half spoken and continued after a pause for irrelevant thought. It strays briefly into a swell of post-rock but tricks you out on the last chord change to leave you half-sated. Interrupted finally by a spoken word explanation of the musical gap we’re currently experiencing it’s more than unusual, a VHS bedsit hymn from another world. Certainly there are fractures here in this clown-eyed world view, and seemingly unnecessary attempts like ‘I’ve Begun to Fall in Love’, which sounds overtly Lynchian, present not boredom, just puzzles; alternative understandings of conventions. Moore opens ‘Treat Me’ with the words “Fun, 2,3,4” and begs “Treat me like you would treat a disaster movie / treat me groovy” and you know, you absolutely know that while this could sound like someone who has forgotten what music should sound like, it’s more likely that it’s someone who has fully understood music’s tropes and devices and related to them differently; expressing them in an entirely unique way. Moore is a collage artist of the highest, silliest, most joyful degree – and as he pulls together strands of strange, whisps of weird, odours of otherness you’ll be compelled to dig, dig deeper into the man’s psyche and back catalogue. And be rightly, wrongly rewarded. clear; all of pop music is here. Some may think Robert Pollard the most prolific DIY artist. Not only, however, is R Stevie Moore actually the more productive artist making fuzzy sounds, but also a man who can lay claim to being the father, perhaps even the grandfather of the broadly-defined movement. Influencing everybody from Pollard to Ariel Pink, Moore’s output, which dates back to the late 1960s, is unrivaled. With Moore’s machine-like work ethic itching to produce the pop songs that enter his mind, it’s a bit odd to listen to a so-called “compilation” of his work, as you’re probably used to listening to Moore’s records as instantaneous moments in the time of his life. However, Personal Appeal, his latest record, is a compilation that, despite consisting of a preselected group of songs, comes across as not only still spontaneous but an effectively cohesive personal statement about his lack of mainstream success over the years. Moore’s frustration is apparent from the get-go: he’s not LCD Soundsystem‘s James Murphy refusing to succumb to commercial playlist whims (as in You Wanted A Hit), but rather someone innocently asking, “Why can’t I write a hit?,” a phrase that’s the namesake of the album’s opening track. Why Cant I Write a Hit’s slinky bass line and generally Sixties-inspired psychedelia in addition to Moore’s twisted falsetto instantly reminds you of something off of Pink’s Mature Themes. Like Pink, Moore is also decidedly self-aware, answering his own rhetorical question by muttering, “The songs are too weird, as the track ends. Over the course of one song, Moore travels from naivety to creepy old man assuredness, skipping Murphy’s phase entirely. Meanwhile, Makeup Shakeup tells the tale of a woman who puts on too much rouge and powder and Moore asking more questions, this time, “Don’t you look good enough? His vocal delivery is comparable to that of Pink’s on Kinski Assassin, but his music is orchestral and disorientingly anachronistic. Yet, on the next track, the equally weird and disquieting Old, Moore opens with distorted, bluesy guitar and adds sound effects akin to those on Pink Floyd’s Time. The musical transition from track to track on Personal Appeal, which spans Moore’s catalogue since the early ’70s, is often quite jarring, as Moore’s an artist with more phases than David Bowie. But thematically, the songs he has chosen to appear on Personal Appeal all correspond to the ideas at play as suggested by the title itself: accessibility versus the avant garde, old versus new, old age versus youth, and popularity versus under the radar status. The more you listen to Personal Appeal, however, the more you judge it on purely musical merits: its ability to write catchy, hooky, enduring pop songs. So while nothing on Personal Appeal quite rivals the jangly catchiness of classic Moore tracks like Sort of Way, some songs come pretty close: ironically, Why Can’t I Write A Hit? and the straightforward but sneakily sticky Copy Me. In addition, some tracks succeed for their pure beauty, like Old and especially bummer The Picture, which somehow remains touching despite its lewd subject matter (Moore laments about a woman he misses and how all he has left is a naked picture of her to which he masturbates). Overall, however, when listening to Personal Appeal – a tremendously satisfying listen nonetheless – you wonder what a Moore record might sound like if he took some time to plan or tweak his musical ideas. For an artist who ostensibly can play almost any instrument, Moore has the ability to create an immaculately composed, multi-instrumental album. Instead, for his entire career, he’s chosen quantity over quality, even if the quality level is higher than that of many of his peers. There can’t be many who possess a back catalogue containing more hidden gems and scarcely touched upon curios than R Stevie Moore. Dubbed “The Grandfather of DIY” by some, it’s the only tag that’s ever stuck for this prolific, chameleonic artist, whose cult status has grown over nearly half a century of music making, and whose back catalogue – which numbers in the hundreds of releases - has influenced everyone from Sonic Youth’s Thurston Moore to recent lo-fi pop King Ariel Pink. This wave of musical admiration from peers, both contemporary and new, has helped pushed this once most outsider of musicians towards the wider conscious; the past two years have seen him appear on the cover of Wire, record a session for the BBC, tour Europe and tread festival stages – the consequences of a most endearingly unfashionable artist suddenly finding himself in fashion. Personal Appeal is a series of snapshots and insights into the mind of a man for whom the only editor he had or could answer to during his NJ years was himself. It’s a narrative applied to a mass of frequently brilliant full recordings, half-ideas and experiments, and a reflection on the ups and downs of an artist who continued to strive for his music even when hope of any wider recognition seemed lost. R. Stevie Moore’s body of work is unmanageably vast. One estimate put his discography at over 400 releases, and that was a decade ago. But there’s a simple contradiction running through all of it. On one hand, Moore is the prototypical outsider, mostly home-recording his idiosyncratic tunes since the early 1970’s. Yet he’s also a kind of hyper-insider. Born in Nashville to a session-musician father, he has long explored many established genres, including pop, rock, classical, funk, metal, even hip-hop. Maybe it’s best to think of him as an outsider looking in. His work reveres the history of American popular music, yet his methods prove you can make an original contribution to that canon without bending to commercial conventions. Not that Moore wouldn’t welcome popularity. In fact, his music often struggles with the temptations and frustrations of chasing success and fame. One example opens Personal Appeal, a compilation culled from three decades of his mail-order “Cassette Club” series. It’s called “Why Can’t I Write a Hit?”, which Moore must mean as at least half a joke-- he clearly can write catchy hooks and choruses, and he knows it. His music is so full of them sometimes you wonder if they’re the only thing in his brain. Moore’s aversion to easy solutions-- alongside his obsession with diverse musical styles-- can make listening to him a whiplash-inducing challenge. The tonal shifts come hard and fast, and I often find myself skipping over a few tracks on any given Moore album, especially the more precious pieces whose novelty can be hard to see beyond. But his high-speed unpredictability is ultimately thrilling, and delivers lots of payoffs. You can approach his music the way Mark Twain advised dealing with the weather in New England: if you don’t like it, just wait a few minutes. You can also wait until the next time Moore devotees pick gems from his back catalogue to reissue. Right now is a particularly good period: alongside Care in the Community’s Personal Appeal, Brooklyn’s Personal Injury-- a label that’s so far solely focused on Moore records-- has reissued 1978’s Delicate Tension and 1986’s Glad Music. All three offer solid entry points into Moore’s oeuvre, and the fact that I’m not sure which to recommend first is testament to how tireless Moore is. There are ups and downs on each, but you never get the sense that he’s phoning anything in. He’s made hundreds of albums because he wants to, not because anyone expected or demanded it. Of these three records Personal Appeal is naturally the most diverse. It offers sides of Moore not often seen elsewhere, like the old-timey crooner of “Quarter Peep Show”, the space-age balladeer of “Man Without a Purpose”, and the looney-tunes rapper of “Forecast”. There are some straighter pop gems too, but the overall variety makes Personal Appeal one of the more dizzying Moore releases-- a considerable feat given how predisposed he is to changing things up. In comparison, Delicate Tension and Glad Music are more consistent. The latter offers the most shoulda-hit tracks, such as the new-wavey “I Like to Stay Home” and the riff-happy “Part of the Problem”. It also has a healthy share of requisite oddball ditties and brain-fired experiments. Delicate Tension goes a bit deeper. In many places across its 14 tracks, Moore gives humor and seriousness equal weight without letting either cancel the other out. It might be overdramatic to say that during tunes like the bouncing “Funny Child” or the “I Go Into Your Mind” (wherein Moore declares “I swim upon your tears”) you won’t know whether to laugh or cry. But Moore certainly knows how to make heavy subjects hilarious and make funny lines moving, in a way matched by few (Captain Beefheart and Eugene Chadbourne come to mind). Both Delicate Tension and Glad Music include some skit-like transitions that give them the feel of an amateur radio show (Moore often employs that style when crafting albums; he even spent time in the early 80s as a DJ on the great freeform station WMFU). In that sense, they sound almost as much like compilations as Personal Appeal does. But then most R. Stevie Moore albums do, and that’s a big part of his charm. When he’s at his best, you feel like you’re getting a well-selected sample from the endless trove of sounds and ideas blubbing inside his brain. R. Stevie Moore is and always will be an oddball. He returns to the music industry as an icon for hipsters everywhere. Ariel Pink is somewhat to blame, ever since referencing him as an influence, but his outstanding musical history is also part of it. Moore has over 400 recorded albums at his studio home in America. Aged 61, he has released his comeback album, Personal Appeal, finally taking his music centre stage, where it belongs. The 15 track album carries a dark and powerful tone, a result from years of hard work in his career. He sings love ballads over classical music and also incorporates some 60’s pop going right through to the 80’s. All are a pleasure to listen to. Album opener, “Why Can’t I Have a Hit?” reveals a great irony, as the song really is a hit. It has comical lyrics, an up-tempo beat and is extremely catchy, everything you want in a hit song. Next song, “Makeup Shakeup” is a classical love ballad full of pent up frustration. The cockney accent on an American singer was strange to hear but he has perfected it. “Old” starts with a lone guitar and shows just how much Moore loves his instruments. Each new song is different to the last, showing Moore’s versatile material and talent. Personal Appeal is a welcome change and is completely different to my normal music library. I loved the madness of it all, especially the album cover where Moore looks like a mad scientist. Overall, Personal Appeal was a refreshing album to listen to. R STEVIE MOORE "PERSONAL APPEAL"
Moore has been making music, prolifically, since 1973; that's forty years. This tiny fraction of the immense cataloge is drawn from 1973 to 2001. Moore has long been the outsider's outsider; his imagination is almost boundless, there's nothing much he hasn't tried, nothing much he wouldn't try, nothing is off limits, there is no off switch. If you think of him as part Zappa, part Robert Pollard, part Ween, part Lou Barlow and then add in Elvis, Brian Wilson and Jendak and you get somewhere near to the kaleidoscopic complexity of the man. He's kind of a prankster too; 'Quarter Peep Show' is whacked out weird, Eugene Chadbourne at his most obtuse is perhaps the closest you'll get, then immediately 'I've Begun to Fall in Love' comes along sounding like Brian Wilson in the midst of a breakdown, naked unwashed and giving vent to the beauty that is spilling out of his mind. Roy Wood could have penned 'Why Can't I Write a Hit?'. that fun mix of self-awareness with an instinctive grasp of what makes a song great. Using a string quartet on 'Makeup Shakeup' might seem like a strange move but for Moore, as I've said, music is a playbox and he's happy to pick up anything that's in there. Obscurity is guaranteed when you write songs like 'Pretend for a Second That You Are Very Intelligent' which at first listen seems like a title in search of a song but really is searing critique of rock music and which eventually spawns a Neu style freakout. 'Treat Me' starts with some free jazz saxaphone before settling into a Nuggety psych-pop stomp complete with more brass based blowouts. No two songs are unified by anything other than Moore's imagination, of course they are curated from a vast archive across a long period but still you might expect some degree of coherence. Not a chance, but if you want coherence and easily digested fare you wouldn't go to Moore, even if he can crank out a tune when he wants(see the mildly Cure-ish 'Copy Me') and that Picasso bloke, well he could really paint if he wanted too. It’s a brave person who whittles down the output of R Stevie Moore to one CD. Since 1969, he’s made at least 175 albums, a significant proportion of which he committed to cassette tape. There are also a similar amount of singles, live albums and collaborative efforts. Handily, the British label Care in the Community has taken up the challenge and, instead of releasing a compilation which darts off all over the place stylistically, has issued a disc which unfolds as a unified album. No mean feat considering that the tracks on Personal Appeal originally appeared on cassettes between 1973 and 2001. Notwithstanding a brief dance with cult fame in mid-Eighties France, interest in Moore is running at an all-time high. His home-recorded music is the single most important influence on Ariel Pink, and it’s doubtful that the chill-wave types who arrived in Pink’s wake could have existed without Moore’s example. At 61 he has become an unlikely posterboy for a generation of DIY musicians. Seen on the next page, Arnaud Maguet’s documentary I am a Genius (and There’s Nothing I can do About it) encapsulates Moore’s world impeccably. The musical logorrhoea suggests Moore’s music might be inaccessible or wildly experimental. It isn’t. Brought up in Nashville and with a session musician father, his influences are mainstream. The Beatles are amongst his favourites. Despite the occasionally murky sound quality, Personal Appeal’s psychedelic pop is melodic, quirky and hugely enjoyable. If he’d been so inclined, in the late Seventies Moore could have carved a niche akin to that of XTC. The unsettling “The Picture” (from 1978) sounds like Kevin Ayers at his most intimate, while “I’ve Begun to Fall in Love” (1975) is The Beach Boys’ “Caroline No” reflected in a very misty mirror. “Man Without a Purpose” (2001) submerges Todd Rundgren’s “International Feel” underwater. At times, this seems like a lost Super Furry Animals album. As a window into this eccentric artist’s world, Personal Appeal is valuable. It’s also great fun. Over a funny interview with R. Stevie Moore in the TV Scott & Gary Show of 1984, where at the end of Moore performs the song "Going Down The Way". For many decades, his work has been pushed underground and considered unfashionable. 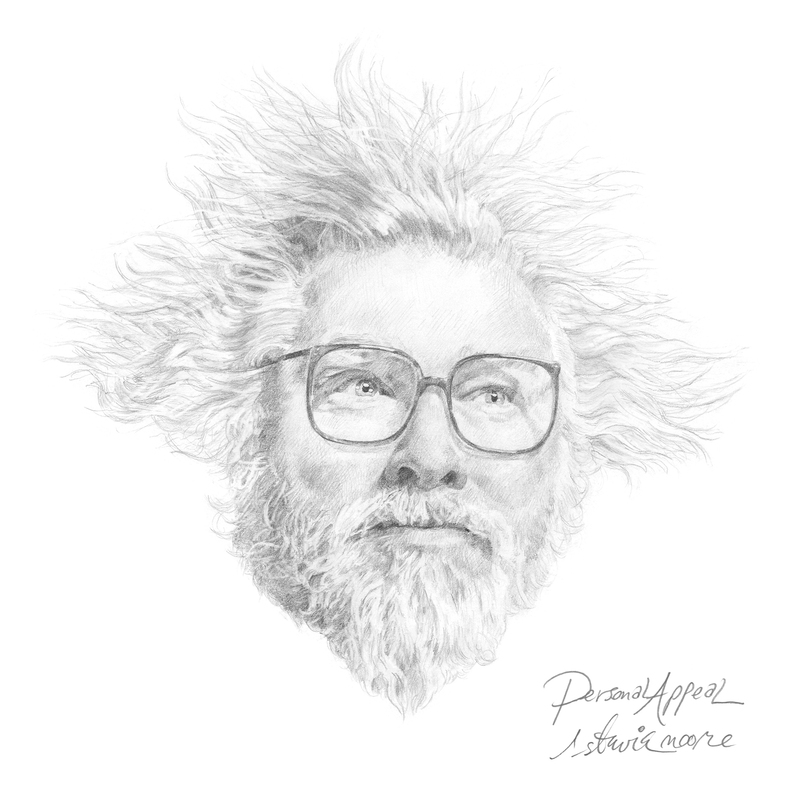 Last year proved to be more kind to R. Stevie Moore and artist managed to swim to the surface, as evidenced by even the appearance of the cover of "The Wire" in 2012. R. Stevie Moore is an incredibly charismatic singer, songwriter and multi-instrumentalist coming from Nashville. Dubbed by some as the "grandfather DIY" and sometimes called "the great-grandfather of lo-fi." Thurston Moore of Sonic Youth, said: J ego extremely directory and created hundreds of recordings has a huge influence on many artists in recent years, ranging from the King of lo-fi Ariel Pink's . His work is more than four albums, released (mostly self-released under the name of R. Stevie Moore) for over 30 years. The range of stylistic plates Moore began with the common species of the experimental and much more. Moore has always been and still remains a true musical chameleon. The professional debut of Robert Stevie Moore scored at the age of seven years on the album "Songs to Warm the Heart". In 1967 he founded with his friends from school rock band The Marlborough. He was then a session musician and assistant at Mimosa Music label founded by his father. In 1976, he released his first, recorded at home, the album "Phonography". Two years later, after moving to New Jersey released two more albums "Stance (EP)" and "Delicate Tension". The insert included with the album "Pearls Appeal" Irwin Chusid tells how Moore moved in 1978 to New Jersey in 2010 to return to his native Tennessee: His life was falling apart, he was homeless, penniless, and tormented him chronic illness and collapse mental health. Then all the friends they thought they saw him last . In 1981, Moore began to publish their home recordings under the name RSM Cassette Club. In recent years, he recorded albums such as common with Yukio Yungiem, with Dave Gregory'm group XTC, and the Venom Fair of Half Japanese. He also collaborated with Ariel Pinek. In early August of this year saw the release of R. Stevie Moore - "Personal Appeal" representing a cross-sectional material from the years 1973-2001. This compilation has released a tiny British label Care in the Community . This is the ideal position of the first contact for those who have little to say Moore's character. The "Pearls Appeal 'was fifteen compositions and is a journey through the unique work of this artist. The opening recording "Why Can not I Write A Hit?" March bass sounds like the best parts of Jaco Pastorius. Moore often weaves in his works known motifs borrowed from classical music. A real gem of a recording "Structure Of Love" - ​​guitar piece, showing Moore's original approach to the instrument, seasoned with folk traditions of the southern United States. It seems to me like I'm listening to track smog from the initial period. Ballad know in the artist's composition "The Picture", where Moore deftly accompanies the acoustic guitar and harmonica, and his great vocal buckle fastens a beautiful recording. "The Picture" is not equivalent to the best works of Neil Young. Excerpt "I've Begun To Fall In Love" came in 1976 with their first album Moore and looks great music style. This recording is a one-to-one by comparing it with the work of Ariel Pink's. Except that Ariel Marcus Rosenberg was not even born when we have the song "I've Begun To Fall In Love". Moore's recognizable style is a unique approach to singing, the parties often testing the limits recitation to music, then go into the high registers, typically ending piosenkowym phrasing and so on alternately. Moore's teammates create for its breakneck vocal lines harmonically complex accompaniment. At certain points Moore singing reminds me of the antics of Frank Zappa and Robert Wyatt. Full of nostalgia and absolutely innovative recording is "No Body" and "Man Without A Purpose". The fact that Moore is a musical chameleon confirms the song "Treat Me". Number begins with free-jazz saxophone, freely moving - as if nothing had happened - the melodious songs. Level stylistic jumps in Moore is a real challenge for many artists. And for that Stevie can repeat the feat several times during one song suddenly lasting two or three minutes. I've run into compilation "Personal Appeal" recording "Ist Or Mas" with Moore's second album "Delicate Tension" in 1978. The song "Ist Or Mas" shows us the face of yet another American, where we have a section entirely instrumental electronic music using synth. One of the last compositions of "Personal Appeal" to "Copy Me". You can hear that Moore was also one of the founders of grunge. I still can not believe that R. Stevie Moore is not inscribed in his brilliant achievements in the phonographic wider audience. I did not see anyone named in the same breath when describing the name of Moore's new CD, say, Ariel Pink's. We could list a whole host of other artists from the indie rock, lo-fi, or in the words of the magazine "The Wire" hipnagogicznego pop. It should be clearly noted by the thick line that it was R. Stevie Moore has set new trends in music, what is going on with many contractors since 1990. Do not forget the music aliens and those who first walked the pristine planets. Moore is definitely alien and astronaut in one person, because from the very beginning to live on their own planet. There's something a little amusing about R. Stevie Moore releasing a rarities and obscurities collection. The 'Grandfather of DIY' has been putting out albums on everything from vinyl to cassette since the 70s meaning he has an extensive back-catalogue, but one that is often tough to track down. He is an artist that, despite his constant and consistent output, only seems to come to the fore when somebody highlights him as an influence (most recently his kindred spirit Ariel Pink). Personal Appeal is made up of tracks he self-released on his own 'Cassette Club', meaning that these are some of the rarest of all, and even those that have tracked down his studio albums will find something new here. Many artists have taken an influence from Moore's work, but the only one that predates it and comes close to sounding anything like him are the early albums by Frank Zappa and the Mothers of Invention. Personal Appeal shows off the same joyful clashing of genres, an urge to highlight contrasts between sounds rather than smooth them out. The wry satire of life and, in particular, the music industry is also present in Moore's work. On 'Pretend for a Second That You Are Very Intelligent', Moore attacks the staleness of rock 'n' roll, accusing it of being "constipated" over a strange lounge-jazz nursery rhyme. 'Why Can't I Write a Hit-Song' is, ironically, the catchiest song on the album, a stuttering piece of surf punk and anthem for outsiders, which simultaneously criticises the vacuous nature of record labels and reveals Moore's own frustration and insecurity without descending into self-obsessed whinging. It is this, the ability to mix the amusing with the touching, that separates Moore from Zappa, and laid the ground for acts as diverse as Pavement, Ariel Pink or Jeffrey Lewis. On this collection, we see Moore's skill at finding beauty and sentimentality in the most unlikely of subject matters. 'The Picture' is the most touching piece of music you're ever likely to hear about voyeuristic masturbation. Built on acoustic guitar and mournful harmonica, it would in the wrong hands be a piece of disposable comedy rock. However, the depiction of clinging to a naughty photograph of an ex girlfriend ("All I can do is look at your privates in a book") somehow becomes genuinely moving, capturing the kind of response to heartbreak that most artists don't care to acknowledge. The orchestral synth stabs of 'I've Begun to Fall in Love' sound like post-Pet Sounds Beach Boys, a sudden piece of beautiful sunburnt pop that is the most unexpected track on the album, simply because it is such a simple, pretty piece of music, and shows the sheer versatility of Moore's composition and production skills. Personal Appeal serves as a reminder that homemade, DIY music doesn't have to be an excuse for laziness. Some artists will take a similar aesthetic to Moore, but create music that is essentially just a more shambolic version of mainstream pop. This collection, however, shows versatility, ambition and a unique vision, using the home studio as an opportunity to experiment without the constraints of paying for studio time. The theatrical strings of 'Makeup Shakeup' makes it sound like it could come from a Broadway musical. 'Quarter Peep Show' is a banjo-led bluegrass hoedown with multi-tracked and echo-laden vocals. Throughout, it's clear Moore is a hugely talented musician and producer, but these skills are never overly indulged, instead being used to create Moore's surrealist take on popular culture. It's rare to get a compilation album that will have value as much to people who've already got an artist's studio albums as to those who've never heard of them. The selection and sequencing of the tracks makes the whole thing hang together as an album in its own right, and one is left with a lovely set of off-kilter pop songs as well as nice historical document of the madcap experiments of a genuine eccentric.